The Human Race to the Future: What Could Happen — and What to Do, Fourth Edition by Daniel Berleant. Read the paperback and Kindle versions. Prospects for Human Survival, Second Edition by Willard H. Wells. Read the paperback and Kindle versions. Use the below form to donate for general support of our books or you can specify that your donation goes towards marketing of our books. 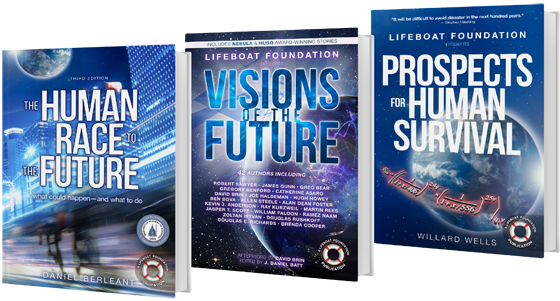 If you donate $25 or more you are eligible for a copy of the paperback book and/or our Kindle edition of the book of your choice. (If you donate $50 you can pick two books, etc.) You can get a Kindle version for free with every paperback that you select! If you donate $100 or more you are eligible for a copy of a paperback autographed by the author/editor with the inscription of your choice. If you donate $25 or more you are eligible for a copy of a paperback and/or Kindle edition. (If you donate $50 you can pick two books, etc.) If you donate $100 or more you are eligible for a copy of a paperback autographed by the author/editor. Use the comments section to describe any book inscription that you want. Check the boxes for any items that you would like.